Residents were delighted to learn that the Board of the Malvern Hills Trust voted on 19th March 2019 to refuse the Chance Lane Easement seeking approval for a new highway across the common. Quite rightly so, as this land is not earmarked for development, and local housing needs will be more than met by new homes approved at Newland and the old RSRE South Site. The Malvern Hills Trust has announced that the meeting to discuss the controversial application for an easement across public land at Chance Lane has been rearranged for Tuesday 19th March 2019 at 7 pm in the Gryphon Room, Malvern College - see noticeboard. If you object to this proposal, which could damage the eastern approach to Malvern, please come along to the meeting and support other residents. History of Malvern updated with reorganised section about ADRDE arriving at Pale Manor Farm in 1942, and the naming of roads at Malvern Vale. The section about water cure Dr Thomas Rayner died 1891 has been updated with additional information about his parents and siblings. The Malvern Hills Trust have announced that the meeting to decide the Chance Lane Easement provisionally arranged for 28th February cannot now go ahead due to a delay in obtaining legal advice from Counsel regarding matters raised by residents. The Trust hopes to advise a new date at or before the next meeting of the Board on 14th March 2019. A Happy New Year to one and all. Our MPs have returned to Parliament and are fiercely debating Brexit, while the Malvern Hills Trust has provisionally rescheduled their meeting which had been planned for 20th November 2018 to decide the Chance Lane Easement. The Trust delayed the 20th November meeting in order to consider legal points raised by residents, and the advice from their Counsel was discussed at the MHT's Governance meeting on 24th January 2019 - the public was excluded from discussion of that matter, as the MHT considered the public's presence to be prejudicial to the public interest. Another example of the Trust's secrecy. If you object to this proposal, which could damage the eastern gateway to Malvern, please come along to the meeting on and support other residents. The Trust say the special meeting on 20th November has had to be posponed due to unforeseen circumstances. We speculate it may be delayed until the new year. The Malvern Hills Trust announced at the Board meeting on 8th November that the special meeting to decide the Chance Lane and Jackpit Lane easements would be on Tuesday 20th November at 7:00 pm in the 'cricket pavilion' next to the Council Offices otherwise known as The Council Chamber, Priory Lodge. A copy of the MHT papers and the applicant's submission can be obtained from the reception desk at the MHT office in Grange Road. If you wish to ask a question at the special meeting this has to be lodged with the Trust by noon on Friday 16th November. This can be either sent by email or handed in at reception. The Rose Farm Partnership is seeking this access to facilitate building two and three storey houses in the field known as Rose Farm opposite the Green Dragon pub on the Guarlford Road. If you object to this proposal, which could damage the eastern gateway to Malvern, please come along to the meeting on Tuesday 20th and support other residents. New article added Changes afoot at the Malvern Hills Trust. The purpose of this report is to alert precept payers to the Charity Commission Scheme which the Malvern Hills Trust hopes to set in place granting new powers and possibly overriding or amending parts of the Malvern Hills Acts. There has to be a public consultation, during which residents and stakeholders will have the opportunity to comment on the proposals. Possibly this will start in December 2018 - it is important you have your say. Page about the Friends of the Commons of Malvern updated; please note new email adddress. The agenda for the next Malvern Hills Trust Land Management Committee is put on the MHT website. It is noted there is a proposal to amend the Easement Policy which would give the Chairman carte blanche to bypass the Land Management Committee and places much greater emphasis on the money to be made by granting easements. Minor edits to pages about Great Malvern Cemetery and its memorials and addition of a new page named 'Tour 6'. Review added of art reference book about the 'McCulloch Collection', by New Zealand historian Lawrence McCallum, including details of where and how to buy. New page added with photos of gathering on the Worcestershire Beacon. Menu button added at the top of the Home Page. Clicking this will display the navigation bar as a list which may be easier to tap if you are using a device with a small screen? Apologies if you could not find our website on Monday night and Tuesday morning; the hosting company reported a networking problem. The Friends of the Commons of Malvern are organising a gathering at the Toposcope on the Worcestershire Beacon at 2pm on Saturday 15th September in order to photograph views of the commons from the hills and demonstrate support against the Easement from Chance Lane into Rose Farm that is being considered by the Malvern Hills Trust. MHDC has introduced a flat charge of £1.50 for parking all evening from 4:00 pm at the Splash. Note however that the concession for residents with Timewheels to park for free for more than 2 hours after 6:00 pm has been withdrawn. Rebadging and checking of web pages is ongoing. We are mainly tidying up the title and navigation at the top of each page, not the content, but in doing this we are finding some of the older links no longer work and need updating. Link to a short update from the newly formed residents' association added to the Friends of the Commons page. Residents continue to lobby the Malvern Hills Trust, recommending that it should not approve Easements into Rose Farm, which is the field bounded by Hall Green, Chance Lane, Jackpit Lane and the Guarlford Road; it is in fact the field shown in the picture above. The Friends of the Commons of Malvern residents' association page, which has more information, has been updated. A to Z index updated and minor tidying up of the header of some pages to reflect new domain, but still some work on 'rebranding' to do. A car travelling from Barnards Green towards Guarlford was hit by a vehicle pulling out of Chance Lane. Three police cars and an ambulance were in attendance at 4 pm when we passed the scene. One vehicle seems to have crossed the common knocking down the Chance Lane sign before colliding with the hedge. A second vehicle with severe frontal damage was taken away on a low loader in the evening. 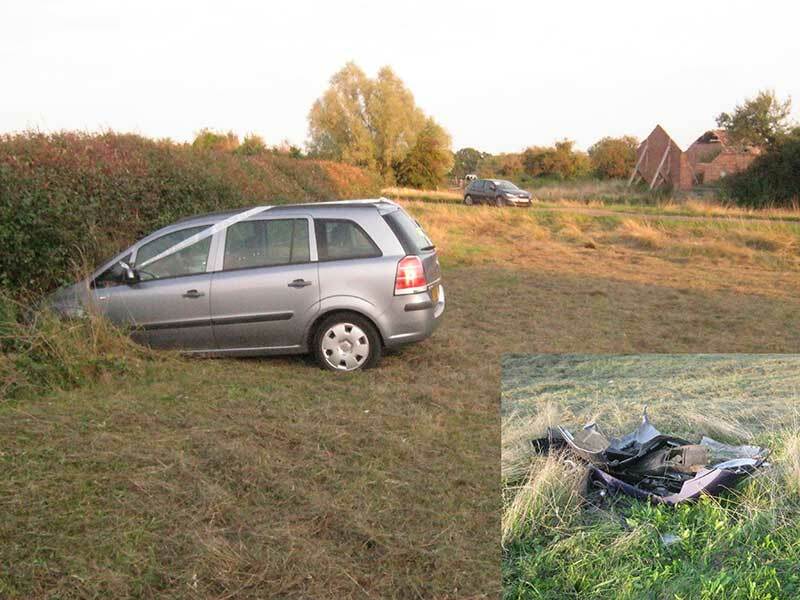 The picture above shows the Vauxhall Zafira which collided with the hedge, with front wheel in the ditch below; the air bags had been activated. Inset is picture of debris piled near the junction. Draft page added about The Friends of the Commons of Malvern residents association set up with a view to promoting and protecting the character of the lowland commons east of the Malvern Hills. Page about Rothwell and Milbourne's garage updated with new information about William Henry Mayo and Joseph Coley who were earlier pioneers in the motor trade. As much of our website now relates to the history of Malvern and the Malvern Hills we are transferring our website files from www.123-mcc.com to the new domain www.the-malvern-hills.uk; once this is complete the old web hosting will be closed and the old domain should forward to the new one. There is a small chance we may have forgotten to amend a link pointing to 123-mcc.com which will fail to work once the old legacy hosting is closed; please do let us know if you encounter a problem using the new website and then we can fix it. A meeting was held in Guarlford Village Hall at which Guarlford Road and Hall Green residents were joined by other interested parties to discuss the easements requested by the Rose Farm partnership. The Developers want access from Chance Lane and Hall Green Close into the field which lies opposite the Green Dragon on the Guarlford Road, in order to build a new housing estate; which could be potentially 400 houses. 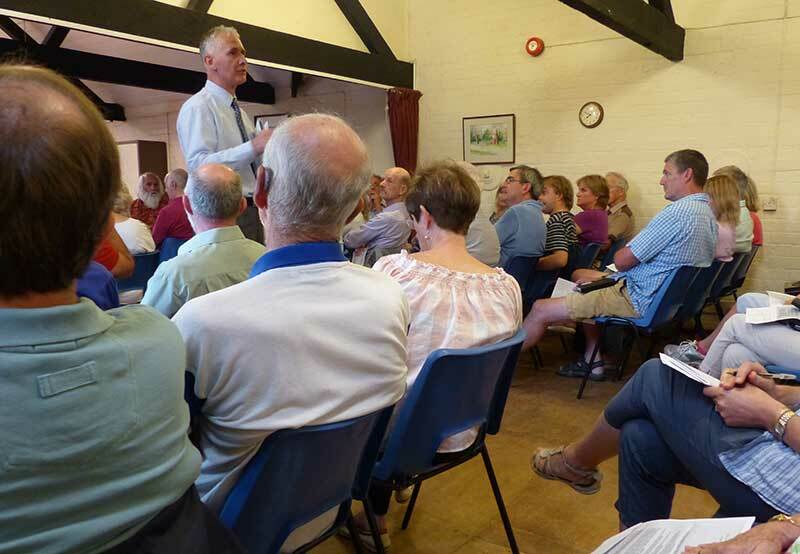 However, at this stage there appears to be no detailed plan or planning application and the land is not earmarked for development in either the current South Worcestershire Development Plan (SWDP) or Town Plan..
At the meeting Dr Graeme Crisp voiced residents' concerns and Duncan Bridges, Chief Executive of the Malvern Hills Trust, responded on behalf of the Trust. A lively question and answer session followed. Residents are very worried about these easements and voted to form a Residents Association to fight the application; there is concern that full details of the application are not being shared with the public. The Malvern Hills Trust say the deadline for responses has been extended to Friday 17th August 2018, and it is possible the MHT Board will meet to decide the application on 13th September. Can we continue to trust the Malvern Hills Trust? About March 2017 an approach was made by a body now calling itself the Rose Farm Partnership seeking an easement from the Malvern Hills Trust, formerly known as the Malvern Hills Conservators, for a new access from Chance Lane into the field opposite the Green Dragon on the Guarlford Road. For fifteen months the Malvern Hills Trust has been rather secretive about this and not releasing any information until 14th July 2018 when letters were put through the doors of neighbouring properties - showing a proposed new road across the common in order to facilitate building a housing estate on the field, which is bounded by the Guarlford Road, Jackpits Lane and Chance Lane. A further access from the field into Hall Green Close, crossing Jackpits Lane, is also being proposed by the developer in order to provide a pedestrian cycle way and emergency access click to view plan circulated to residents. The dilemma for the Malvern Hills Trust is whether to continue to protect common land for local people, or make a lot of money from granting an easement. Few precept payers have been consulted about this, but we think everyone has a right to make their views known before the Board comes to a decision. Noticeboard updated with details of Madresfield school fete on 23rd June 2018. Do come along to Madresfield Court and support this marvellous school fundraising event if you can. Minor edits to 'A Short History of Malvern'. Minor updates to page about Madresfield in Worcestershire. There is a new page on the Guarlford Parish website reflecting that the church of St Mary at Guarlford is part of the Benefice of Powick and Guarlford and Madresfield with Newland. It appears that the Powick Parish website is not working at the moment except for a home page that directs you to either Parish Council pages, which are now hosted by Worcester County Council, or to 'A Church Near You'. List of churches in Malvern updated; primarily we have added links to websites, where there were none before, and fixed links that no longer worked. On 27th May at Powick Rev Gary Crellin was inducted as the new incumbent of the Benefice of Powick and Guarlford and Madresfield with Newland. 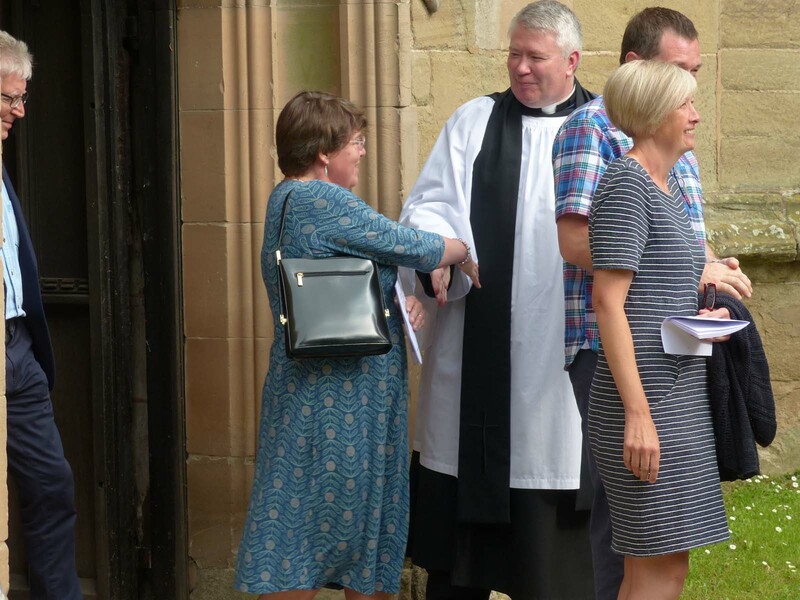 Photo: Rev Gary Crellin greeting Julie Greenwood, Headmistress of Madresfield C of E Primary School after service at St Peters Powick. Update of the biography of James MacKenzie who retired to Daresbury in Priory Road and died in 1916. Addition of information about Bernard Beattie Slater to the page about the proprietors of Rothwell and Milbourne's garage. New page added about the history of Rothwell and Milbourne's garage which started under that name about 1919 and closed in 1990. Please do tell us if you know more about Joseph Rothwell who we think may have founded the business. Congratulations to Brian on winning Mastermind. It was a tense moment when the last person to go almost reached Brian's score! Brian Chesney leads the U3A Social History Group and we enjoy listening to his informative talks; the current series is about British Prime Ministers. New information about the Link School added to Malvern schools then and now. Minor edits to list of burial grounds and photos of Malvern churches. Burial grounds in Great Malvern and surrounds updated and index added. The newly formed Welland History Group plans to write a book about the village and surrounds; we went along to their second meeting to chat about how the Guarlford Story was produced. We speculate about who founded the garage Rothwell and Milbourne circa 1919 on our page 'A stroll down Worcester Road' - but do we have it right? We have been unable to discover when Malvern Wells Cemetery was opened. Have you come across a report of this in the Malvern News or Malvern Advertiser? Have you come across the grave of General Henry Lygon 4th Earl Beauchamp? His funeral was held at Madresfield on 15th September 1863 and newspaper reports suggest he was interred in the family Mausoleum next to the old church, since demolished, which was near the Court. This event will not now take place as the field used for car parking is waterlogged. New page added A stroll down Worcester Road. It's a first draft and later on we plan to add information about some of the people that once lived there. Do let us know if you can add to the history of either the buildings or residents. Minor edits to biographies of James MacKenzie and Rev William Edward Lloyd. Information about Knotsford Lodge and Abbey Terrace added to A Stroll Down Abbey Road. Addition of an article about James MacKenzie (a Victorian gentleman) who retired to Daresbury in Priory Road in Great Malvern circa 1901. Sadly both his sons were casualties of the Great War and you will find their names inscribed on the Priory War Memorial. Addition of a Street Directory of Priory Road, Great Malvern which attempts to relate the Victorian house names to modern street numbers. You might think this was easy, but nowadays houses typically just have a street number in order to help the postman, old nameplates have disappeared, there has been some infill, and some buildings have been demolished and replaced. Not to mention that house names can change over time. Please do let us know if any corrections are needed or you can add to the history of Priory Road. In recent months congestion caused by parking in Avenue Road and side streets around Great Malvern Station has become a serious problem. Parked cars are obstructing the flow of traffic up and down Avenue Road, making it extremely difficult for cars and buses to pass, and increasing the likelyhood of an accident, particularly on the bend above the station. The cause may be partly due to people using Great Malvern station parking all day to avoid parking charges at Malvern Link. Whatever the cause, we think Malvern Town Council and Worcester Higways need to get a grip on this for example by putting some time limited parking restrictions in place. We have also added a 'History menu' button at the top of the Home Page so that you can jump directly to our section about Local and Social History. Everything else remains the same. New photographs have been added, recording a little more of the town's Victorian architecture in our Stroll Down Back Lane. A page about Priory Road, running below the Malvern Splash, is in preparation. We noted the free car parking time at Waitrose in Great Malvern has been extended from 2 hour to 3 hours; a very welcome development which should make life easier for shoppers over Christmas. Observations on apps that were not working following the v1709 update; these have since been fixed. Article about Great Malvern cemetery extended with more information about those buried, on page 5, including John Sloggett Jenkins who was editor of the Malvern Advertiser newpaper and Matthew Thomas Stevens who founded the Malvern Gazette. Photo of headstone added to biography of JS Jenkins. Page about Davenham and the Dyson Perrins and Dixey families updated. Biography of Gladys Sayle, founder of Ellerslie school, updated with memorial to her sister Pearl in Malvern Wells cemetery. Attribution of photo to art dealer David Croal Thomson corrected. We looked for the memorial to water cure doctor Ralph Barnes Grindrod in St Peter's churchyard at Malvern Wells but could not find it. Do you have a photo or can you tell us exactly where to look? The findagrave.com website was updated in early November 2017 and is much improved; you first have to add the person's name and location of the cemetery in order to create a memorial record; you can then later add photos, a transcription of the inscription and biographical information. We have registered and added Malvern Wells cemetery to the database; Great Malvern cemetery, Great Malvern Priory, and St Matthias in Malvern Link were already listed, but not so far the burial ground at Newland. If you are one of those historians who likes photographing and researching headstones, this could be a good place to leave a copy, likewise information about family graves. New page created containing more information about Parking at Waitrose. According to the Malvern Gazette from 27th July Waitrose are imposing a maximum two hour stay, with a £70 fine imposed by an outsourced operator if your stay is exceeded. That friendly proportionate approach ought to have been enought to discourage long stays, but our observation has been the parking booth was rarely manned, so for some time Waitrose has chosen not to enforce their policy. Two hours is sometimes not long enough for example if you want to do a big shop at Waitrose and then visit other shops on the high street, or the library. If you don't like this draconian proposal you might want to consider sending the company a polite email explaining your objection, and perhaps amplify this by boycotting the Waitrose store for a few months, till management get the message that residents would prefer a more customer friendly approach! In comparison, you can park for up to 3 hours free at Morrisons. Links to other websites updated; things change and some links had stopped working. Biography of Gladys Sayle, founder of Ellerslie school updated - do you have a photo of her? Section about Ellerslie school updated on Malvern Schools Then and Now, and plan of the site added. Photographer CJ Gosvenor added to list of Malvern artists; he and his brother made a photographic record of Ellerslie school circa 1926. Stroll down Orchard Road page tidied up and expanded. We have been told The Cedars in Orchard Road, demolished in 2013 in order to build The Revue, had once been the home of water cure Dr Leopold Stummes. Biography of Scottish/Australian merchant Robert Sellar updated to include image of memorial plaque in Melbourne cathedral. A - Z index updated. Minor edits to page about Malvern School Then and Now including addition of Malvernhurst. Index of McCulloch collection of modern art crossed referenced to information about disposal. Menu added to connect miscellaneous pages about Victorian art. RA catalogue index of 1913 cross referenced to associated Art Journal index.Transcription added about disposal of McCulloch collection. Biography added about the Victorian painter John MacWhirter and his family. Page about Abbey Road in Great Malvern updated with new information about past residents of South Bank, Hampton House and Ellerslie. Minor edits to page about the Victorian water doctors of Great Malvern. Short biography of Rev William Walker added, who was a Victorian schoolmaster. Early in his career he was headmaster of Hanley Castle Grammar School, and later he founded a boys prep school named Connellan College at Townshend House in College Road, once the home of water cure doctor Ralph Barnes Grindrod. Short biography of Dr Ralph Barnes Grindrod added, who was a vigorous promoter of the Temperance movement, a good christian, and founded Malvern's first newspaper, the Malvern Advertiser. For a fuller account of his life you should read his excellent biography written by Janet Grierson, who lived for a time at Park View and was the sister of Cambridge historian Philip Grierson. Biography of John Sloggett Jenkins added, who was the proprietor and editor of the Malvern Advertiser newpaper from 1867 to 1900. Malvern Hills Footpath Society added to local links. An early 'portrait of a gentleman' added to biography of Norman May, which was kindly sent to us by Steve Fox. Do please tell us if you know who the sitter is. New link added to the History Menu pointing to our tour of Barnards Green shops in 2012. In the five years since we took the photos many businesses have changed hands, so this page has been essentially relegated to archive status. New page added 'Barnards Green, Malvern, then and now' which complements our tour of the shops - if you want to find out more about the history of Barnards Green you are advised to contact the curator at Malvern Museum who is leading an in depth study. Street directory of Graham Road updated, but still more to add about past residents. Minor amendments to Family History page about baker John Brown, and new page with transcription of the obituary of his great great nephew Gordon Dunlop. Memories of The Hill School incorporated; these were sent to us by Tony Gwynn-Jones who emigrated to Australia in 1952. Tony arrived at the school before WWII and his account includes interesting reminiscences of wartime Malvern. We wish all our readers and contributors a very happy new year. Minor edits to home page and update of our index to the Royal Academy catalogue of 1909 describing the McCulloch Collection of Modern Art. First draft of modern street directory of Graham Road, with photographs, added. We have attempted to cross reference this with Stevens' street directory of 1911, but it has been hard work - do let us know if any corrections are needed or you can provide photos showing the architectural features of houses that cannot be seen from the road. Street directory of Graham Road, Malvern, added, transcribed from Stevens Directory of 1911. This reflects the order of houses in the street, and might help in locating a house that has changed its name. Many houses still stand and have retained their original name, but some have a new name, and one or two are recently built such as Hillstone House and Hillstone Mews. Biography added about MT Stevens (1866 - 1944) who founded The Malvern Gazette newspaper. Biography of Alice Kate Farmer and Schools pages updated with new information about the location of Langland school (1901 - 1912). Biography added about Zachary Merton (1843 - 1915), a metal merchant, who attempted to improve the education of the poor in London. Biography added about George Paterson Yeats, art teacher and Victorian watercolour painter. Family history article about 'Relatives and others in Southampton' updated; it's a rambling account, but if you are able to add to it do get in touch. Following an exhibition in Great Malvern Priory, Victorian painters Mary Brandling and Fanny Steers added to list of Malvern artists and photographers; plus examples of their work and those of George Paterson Yeats. Information about the last days of Hillstone prep school added to page about Malvern schools then and now. More information about Dr John Campbell Fergusson, of the Malvern Hydro, added to page about the water cure. Blogs menu page updated, plus notes on our experience of upgrading from BT Broadband to BT Infinity; (this is a neglected area of our website and you won't find a great deal there). Short article about Victorian metal merchant and benefactor 'Zachary Merton' in preparation. Please let us know if you can contribute either some notes on his life, activities of his trust, or a photo of him. Further amendments to page about past Malvern Schools. Pages about Great Malvern cemetery tidied up and new page 4 added including a transcription of the tribute to Rev William Grundy, headmaster of Malvern College who died in 1891 aged only 41 years. Short article added about journalist Ernest Jack Quill who was awarded the Distinguished Conduct Medal in WWII. Article about Hillstone School expanded. Do let us now if you have any photos of Hillstone or memories of the school, particularly covering the period from 1965 to 1992 when the site in Como Road closed. Story of schoolmistress Alice Kate Farmer updated, and obituary added. Page about past Malvern schools updated with addition of more photos of Southlea school; photo of the WWII Roll of Honour of the Link School, which now resides in Malvern Museum; and memories of St Nicholas School for girls in Cowleigh Road, North Malvern which closed in 1957. Page about the water doctors of Great Malvern updated, with enlarged section about Dr Thomas Rayner who took over the water cure establishment at Park View from James Wilson MD. Minor edits made to pages about Abbey Road (addition of photo of James Wilson's memorial); Great Malvern Cemetery; the Priory churchyard; and photographer Norman May. Biography of Alice Kate Farmer updated; from 1920 to 1944 she was Councillor for the Trinity Ward of the Urban District Council and eventually vice-chairman of the UDC. Page about Malvern schools updated with information about past headmasters of the Wells House prep school, and Clarendon. Minor changes made to the biography of Norman May, photographer. 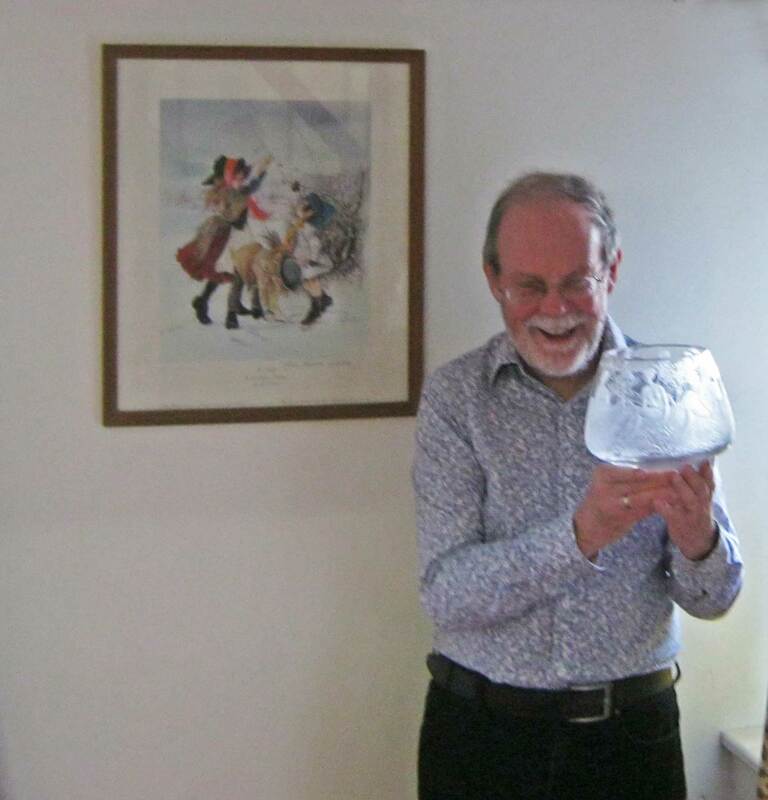 More information about CD Walton added to page about Malvern artists and photographers. Second page about Great Malvern cemetery amended with revised section about Victor William Price who was killed in a flying accident in WWI, and his nephew Neville Bellamy. New page added about schoolmistress Amy Flint who founded a girls' school named Clarendon in Cowleigh Road North Malvern about 1898. The school flourished but left Malvern and relocated to North Wales in 1948. New page added about school mistress Alice Kate Farmer who ran a school for young ladies at Langland House in Graham Road Great Malvern, before the First World War. Towards the end of WWI she was one of the founders of Malvern Women's Institute, and supported National Kitchens to help the poorly nourished. Minor updates made to past Malvern schools, including St Nicholas prep at Cowleigh Bank. Information about Clarendon House girls' school still to add. Do let us know if you have stories or photos of closed schools. New page added containing historical information we have gathered about artists and photographers, mostly Victorian, having a connection with Malvern. Do please let us know either of any errors or if you can provide supplementary information, or photos. Mini biography added about Norman John May who founded a photographic business known as Norman May's Studio in Church Street, Great Malvern in the late 1870s. Do let us know if you can tell us more about Norman May, the evolution of the business under subsequent owners, or can provide photos that could be incorporated on the webpage. We are immensely grateful to those who send us information so that our web pages about local and social history can either be amended or extended. In the last fortnight the history of Malvern schools past and present has been updated, with significant new information added about Southlea in Albert Road, and The Hill which was on the Worcester Road; a big thank you to Peter Gibbs and John Webb for that. Notes on the occupancy of Tudor House after 1891 have been added to the page about the water cure; thankyou to Michele Losse for helping with that. Images from Malvern Museum have been added to our page about Holly Mount Mansion. The story about blind clergyman William Edward Lloyd has been updated following receipt of new information from David Scott, a former archivist at Worcester College for the Blind; more to add. We finally finished our photographic record of the memorials in Guarlford churchyard to link to the inscriptions recorded by Cora Weaver et al circa 1990; the list of inscriptions can be found on the Guarlford Parish website. Please do let us know if you would like your stories and photographs copied to Malvern Museum. Article added attributing the painting of George McCulloch in the Broken Hill Art Gallery, New South Wales, thought to be by 'Manks', to the Welsh portrait painter Barnett Samuel Marks. We wish all our readers a happy new year. Short biography added about Revd William Edward Lloyd who despite a disability became a clergyman after attending Worcester Blind College. Details of Chesfield added to page about Victorian houses in Abbey Road. New pages added telling the story of two Victorian houses, Hatley St George in Albert Road South, which for a time was occupied by the Junior House of Malvern Girls' College, and Holly Mount Mansion where Princess Victoria stayed in 1830 when she visited Great Malvern with her mother. Page about relatives and others in Southampton extended. A link to a review of books about the art collector George McCulloch has been added to the History menu; this relates to our glimpse into the world of Victorian art. A panorama of Great Malvern has been added, and minor edits made, to our page about the history of the Malverns. The page about the Victorian water cure has been updated with a little more information about the family of Dr James Wilson, and the history menu tidied. Those interested in DIY may be interested to know a branch of Screwfix has opened in Betony Road, off Townsend Way in Malvern Link. Both Screwfix and B&Q in Spring Lane are part of the Kingfisher group. Business people and those travelling a long distance to events at the Three Counties Showground, who sometimes find local hotels full, may be interested to know that a Premier Inn has opened on the edge of the Trading Estate. There is also a Premier Inn in Worcester next to the cricket ground. Biography added about Rev John Lindsay Birley a schoolmaster and organist who died in Germany in 2003. Minor updates to page about Priory Park Mansion. Biography added about Gladys Sayle who founded Ellerslie school for girls in Abbey Road, Great Malvern, after the First World War. Biography added about Isabel Greenslade a founder of Malvern Girls' College, with additional information about her family background and early business associates, Lily Poulton, Blanche Mitchell and Kate Dawson. Biography added about Florence Kate Firth who followed on from Janet Leighton as Principal of Lawnside School. Page about past Malvern schools updated and biographies added about Victorian school teachers Caroline Cooper, Julia Marten Duplock and Janet Leighton. Two pages about buildings in Abbey Road updated. Short story added about the Malvern based Victorian painter James Charles Oldmeadow and his family. Short story added about the family of British painter George Romney (1734 - 1802). Two of his great grandchildren died at Malvern, one of whom is buried in Great Malvern cemetery, whilst another Eliza Jane Romney lived in the town for 30 years or more. Officially the start of Spring in the UK. Though it will probably be a week or two before we see many fresh shoots in gardens here in Malvern. However we have been told there is already a good show of spring flowers in the churchyard at Birlingham near Defford. On Sunday 15th March there will be an opportunity to explore the gardens of Madresfield Court; see noticeboard for details. Some more photos have been added to the story of the Michie Hospital, and a transcription made of The Times newspaper report about the sale of the McCulloch collection of modern art in 1913. Page about Malvern schools amended with more information about, for example, the history of Douglas House and Ellerslie. Pages about Abbey Road and Wells Road updated with more information about Ashfield, Ellerslie, Hampton House, Cherbourg, Southlands and some of the people that lived there. Story of Priory Park Mansion amended. Information about 'Priors Mount' which once stood in Priory Road added to the page about College Road; during WWII it was the Officers Mess for HMS Duke. So many people died or were injured in the Great War. Families in all cities, towns and most, if not all, villages were affected. You will see we have been gathering information about some of the memorials in Malvern (UK) and in a few cases attempted to provide more information about casualties where little has been known. You are welcome to use this, but please check we have got the story right, and do let us know if you can provide further information. Page added about the family of John Nelson, a casualty of the Great War. Page added with a menu of links pointing to pages on this website which mention a casualty of war etc. Putting a name to an old photograph; about Stephen Craddock who for one year was Mayor of Wolverhampton. Two of his nephews died in the Great War. Details of war memorial plaques in St Mary added to page about Madresfield. Burial date added to page about nurse Ethel Mary Lewis who served in the Great War. Page added about St Leonard's Newland churchyard and choristers' war memorial. Addition of a short biography telling the story of the life and times of the Reverend George Shaw Munn, a clergyman of the Church of England, who was Rector of Madresfield in Worcestershire for 49 years, from 1856 to 1905. Addition of a book review, about a group of Victorian painters who became known as The Glasgow Boys. Little previously has been written about Robert Sellar who was the business partner of Victorian Australian politician Sir James McCulloch. Charles Murray Puckle was one of the last partners of the Melbourne firm McCulloch Sellar and Company. His eldest son was killed at Gallipoli and we thought it appropriate also to write a few words about him, on the occasion of the 100th anniversary of the start of the Great War. Additions to miscellaneous pages about Victorian art (see index) and cosmetic updating of some of the HTML tags; both work in progress. Hospital visits and convalescence reduced our activities this year, but we are on the mend and hope to be out and about more in 2014. The A to Z index was last amended in February 2013 and we hope to update shortly. Addition of page about Great Malvern Priory and its churchyard which is not an in depth article, but contains miscellaneous information we have collected. Addition of page about Edmund Wallace Elmslie the architect who designed Great Malvern Railway station and the Imperial Hotel. The article also mentions Dr Archibald Weir a Victorian physician and surgeon. Addition of a transcription of the Will of Major General William Henry Beckwith whose daughters are buried in Guarlford churchyard. You can find out more about the Beckwith sisters and their family on the Guarlford website. Addition of local history page about John Archer who was a hotel keeper during the years when the Water Cure was at its peak. The story of a house named Davenham and Charles William Dyson Perrins. Revision of pages about Malvern Link and Abbey Road. Addition of biography of Ethel Mary Lewis latterly of Malvern Link who was a district nurse and was awarded medals for her service during WWI. Addition of new 'history' page telling the story of surgeon Lawrie Hugh McGavin who worked at the Michie Hospital, and the 'Farnborough Court' Red Cross Hospital during WWI. Addition of new page briefl;y telling the story of the Michie Hospital, which was just one of many establishments set up to treat the casualties of the Great War. Addition of new web page A stroll down Abbey Road Great Malvern with some local history and photos showing examples of nineteenth century architecture. Addition of new web page Out and about in Malvern Link containing photos of some buildings in Malvern Link and their history. Amendments to page about Davenham and Charles William Dyson Perrins. New album added to Photo Gallery with photos of Wucha Jawar Camp which was on the North West Frontier of India near Peshawar circa 1940. There is also a link from our history page and the A-Z index. New page added to Other_Resources named Who is Who with links to help find Malvern Councillors. New history page added telling story of what happened to some radio, TV and engineering companies. Click to view Companies then and now The year 2012 marks 90 years since the first BBC radio broadcast in 1922. Page about the history of Daveham (a residential home for the elderly) updated following the open day which we attended on 20th October 2012. New page added about the village of Madresfield which lies to the east of Malvern Hills. Addition of a local/social history page about the development of the utility services such as gas electricity and water in Great Malvern. Click the link below to view. Land rover button changed to Motoring on all navigation bars, and site map and index brought up to date. Short history of Malvern page updated. Land Rover button on the Home page replaced by Motoring button. Directions to the old LDS family search page added to links. Guide to researching family history updated. Guarlford Grange deleted from list of guest houses - it is now a private residence. 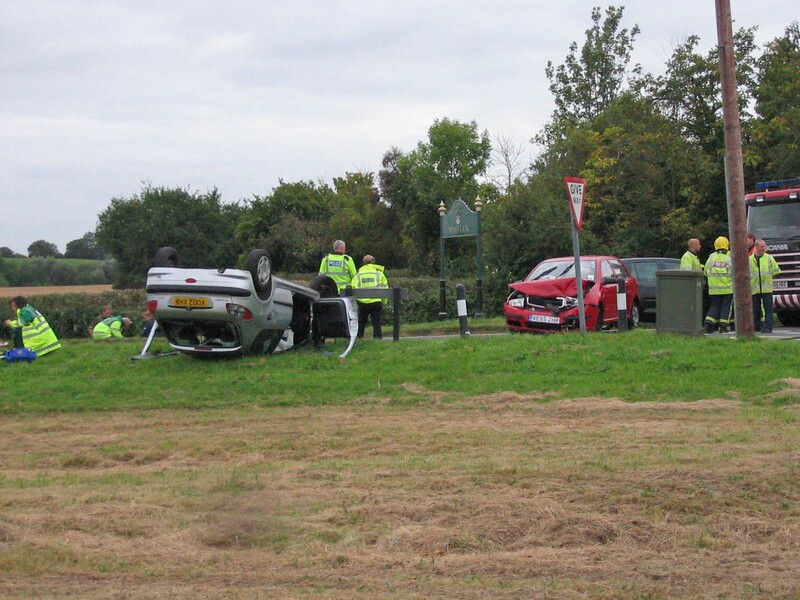 On Monday 12th March there was a road traffic accident on the Guarlford Road near the Green Dragon. No further information available at present. Will transcriptions and UKBMD added to Links page. Details of open day to find out more about draft local development plan added to notice-board. Family history guide updated. Thieves stole the church bell from St Mary's, Guarlford, during the night of Thursday 6th and Friday 7th October. The bell had safely hung in a Hornbeam tree in the churchyard for nearly a century after the turret on the church roof was removed for structural reasons. The thieves cut the cable to the security lamp and tyre tracks suggest a heavy vehicle was involved. Identification: the bell which weighs about 200 Kg is marked at the top M&S.CO and in the middle 'RECAST- 1926'. The bell had also been marked with 'smart water' to aid identification. The thieves had returned after being disturbed the previous night. Family history - main menu page updated. Web pages for visitors to Quothquan and Biggar in Scotland updated. Click this link to go to Quothquan Home Page. Obituary of James McCulloch (1797 - 1849) added to family history pages (see index). Addition of A - Z Index page entered by clicking 'Index' button on right hand side of Home page navigation bar. We awoke to the first reports of the earthquake in Japan coming through on BBC radio. Unusually we had a white Christmas. The snow in Malvern first fell on the 17th December and remained until the thaw began on 28th. The weather was much colder than average with the lowest recorded temperature being minus 15 deg C. Fortunately the main roads were kept clear, but there was plenty of ice on side roads to catch the unwary. Link added to History page about Len Cundell who was a well known racehorse trainer in the 1930s. His story is told in a new book by his daughter Jane McKee. Minor updates to, links, eating out, and list of businesses; reference added at end of guide to researching your family history. Section about 'eyesight' added to 'Ergonomics for users of computers' page (for the benefit of those with slightly impaired vision). A Virgin hot-air balloon with large gondola slung below just misses high voltage cables and clears houses before landing in field opposite. Links added to Other Resources page. Vauxhall Omega skids and crashes into the Gualrford pond railings; this time the railings break spearing into the engine bay. It's only a fortnight or so since the railings were repaired following a car traveling from Malvern ploughing through the railings. A moving service was held at Lansdowne Methodist church where we met to recall that in 1940 the RAF against all odds defended this country, and many gave their lives so that we can live and worship in freedom. There was another collision at the junction of Chance Lane with the main Guarlford road at 4:30 pm. Police, fire, and ambulance vehicles were in attendance and the main road was closed for about half an hour. Click for photo of aftermath of collision. New navigation bar added to web pages. Addition of Bangor reunion photographs; menu accessed from Photo Gallery page. Landrover Discovery unreliability reference page added to resources. Safety in the home and car battery tips added to resources page. Navigation bar added to Notice-board to enable a search for local events and to view items for sale on Malvern Gazette Exchange and Mart site. Titles added to menu and home page links; fade transition added. Web pages rearranged to permit future expansion. We had a wonderful party to celebrate Stuart and Hayfa's marriage last year in Penang.